TECHknitting blog now turns to short rows. Today's post shows the theory. Click here for the how-to (basic short rows, Japanese short rows, wrap and turn, plus other variations). Short rows come in two main types: Short rows worked to create shaping in the MIDDLE of an otherwise ordinary fabric (fabrics knit back-and-forth as well as knit circular) and fabric MADE of short rows. Variations on these two main themes abound also, such as short rows made along a fabric edge and hybrids of the two main types: fabric knit of short rows which has further short rows inserted. In fact, there are newer and more imaginative combinations of short row technique all the time--garments made in wedges and starbursts, beautiful modular fabrics made of bits knitted together in truly innovative ways, even mind-bending mathematical models can be knit with short rows. 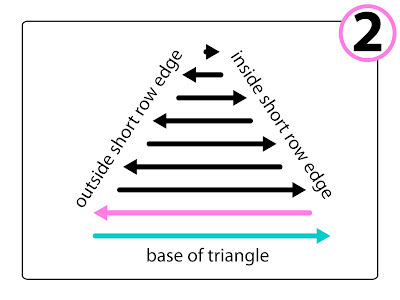 However, the basis of short row technique lays in these two main types. Once these are understood, all else follows. The idea of this trick is to add rows to your knitting which don't go all the way from side to side: little short rows, snuck into the middle of the work. Illustration 1 shows ordinary knitted fabric where each row is worked all the way to the edge. The very last row of this ordinary fabric has been colored yellow, just for reference. 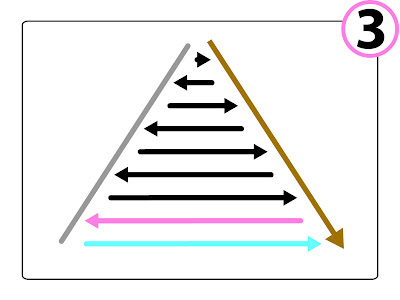 The fabric in this schematic has been knit flat, as shown by the direction of the arrows. Illustration 2: The blue row is not knit all the way to the end. Instead, at the red dot, the work is turned and the red row is worked. ("Turned"=right needle becomes left needle, left needle becomes right needle. You are now looking at the other face of your fabric, and you go off knitting--or purling--in the direction opposite to the way you were working before you "turned.") As shown, the red row does not go all the way to the end either. Instead, the red row is short, too--it stops at the purple dot. Illustration 3. After the red row has been worked to the purple dot, the work is again turned. This time, the next row (green) IS worked all the way to the end. However, as you can see, something interesting is going to happen. The last bit of the green row (indicated with a dashed line) isn't going to contact the red row at all, it's going to have to be knit into the yellow row--specifically, that part of the yellow row indicated by a dashed line. As is evident, adding short rows is going to distort the fabric. This distortion comes in two types: bulging and differential lengthening.Used alone or in combination, these two short-row effects create shaping. Inserting short rows makes fabric bulge outwards where the short rows are. 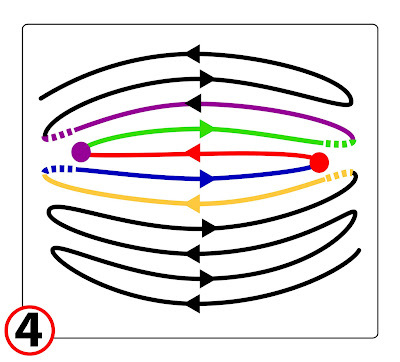 As per illustration 4, when the last bit (dashed line) of the green row is knitted into the bit of the yellow row below it (dashed line), this distorts the right side of the fabric: it pulls the green row down and the the yellow row up while also forcing the blue, red and green rows to bulge outwards. The same along the left side: the purple row is the first regular (long) row above the blue, red and green short rows. The last bit (dashed line) of the purple row must be knit into the underlying bit of the blue row (dashed line). This snugs up the left side to match the right, while bowing the short rows outwards from the left, also. 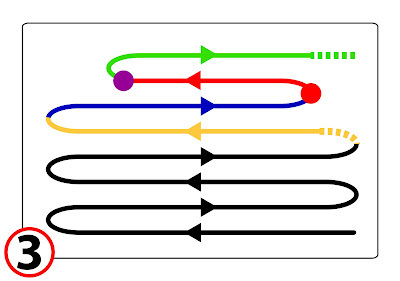 The schematic above shows only three short rows inserted--the blue partial short row (short on the right) the red fully short row (short on both sides) and the green partial short row (short on the left). A single full short row causes a mild outward bulge. Illustration 5: A much more definite bulge can be obtained by further stacking short rows together. This is the basis for short row heels, for example. The heel shown below is a variation on a short row heel. The work begins and ends at the colored dots. As you see, ever-decreasing short rows are followed by ever-increasing short rows, and this self-contained unit of stacked short rows deforms the fabric into a bulge suitable for a heel. Bulging is not the only trick we can do with short rows. Differential lengthening is also possible. Differential lengthening is when a fabric is worked to be longer in the middle, without affecting the length of the fabric at the edges. An example is improving the fit of a sweater back by adding ease via short rows in the middle of the fabric. Specifically, adding a bit more length up the middle of a sweater back helps prevent the back from riding up. 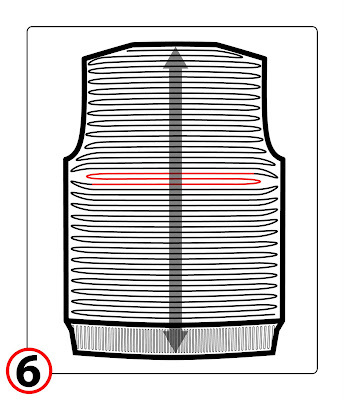 Illustration 6 shows a sweater back lengthened in this way. The short rows do not go all the way to the edge so the edges aren't any longer--a good thing at seam sewing time. Because the back is longer only where the short rows are (gray arrow) the back is said to be "differentially longer" or "differentially lengthened." Bulging and differential lengthening differ only in degree. Both are made using short rows. Which result you get depends on how many short rows you stack in proportion to the surrounding fabric. The more short rows packed in, the greater the bulge. Conversely, fewer, longer rows yield a gentle undetectable differential lengthening. Hybrids exist also: short row bust shaping, for example, creates both bulge and differential lengthening. 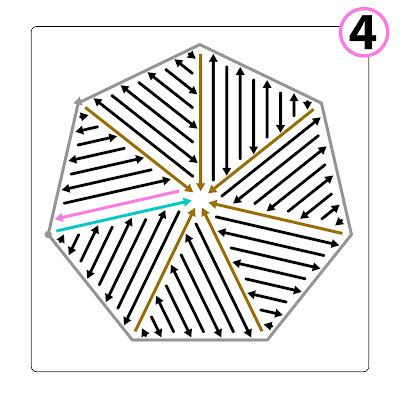 Before turning away from shaping, Illustration 7 shows short rows in circular knitting. Circular knitting is composed not of discrete circles, but rather of an endless stack of spiral rounds. Rounds 1, 2, 3, and 4 (black) are ordinary knitted rounds in such a stack. Round 5 is also an ordinary knitted round--the last one before the short rows. It has been colored yellow for reference. On Round 6, the knitting stops at the red dot. The work is then turned and worked back to the purple dot. This makes the red short row, labeled "S." At the purple dot, the work is again turned, and this time an entire round is knit--round 7, shown in green. 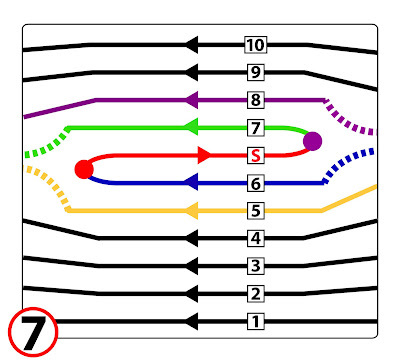 As shown, when round 7 has been worked past the last stitch of the red short row, it must be worked into the underlying round. Because round 6 is a short round, this means round 7 is worked into round 5, the yellow round. After round 7, the short row sequence ends. Round 8 (purple) is a full round. Because round 7 was a short round, this means that as round 8 approaches the area of the short row, it is worked into round 6, the blue round. As round 8 climbs over the area of the short row, it goes from being worked into round 6 (blue) to being worked into round 7 (green). Rounds 9 and 10 (black) are again ordinary full rounds. Inserting the partial short round 6 (blue), the full short row "S" (red) and the partial short round 7 (green) distort the fabric just as it did in a fabric knit back-and-forth (illustration 4). To the right of the short rows (where round 8 meets round 6) and to the left of the short rows (where round 7 meets round 5) the fabric is pinched together. 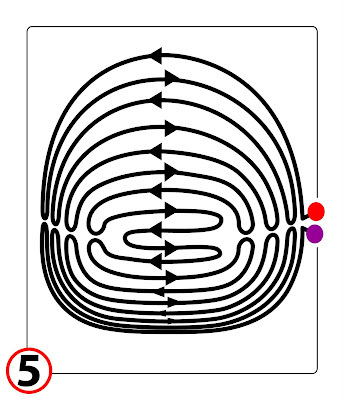 The short round/rows themselves (6, "S," and 7) are forced to bulge outward. Even the ordinary black (full) rounds some distance from the short rows are distorted. Like short rows in flat knitting, whether short rows yield bulge or differential lengthening (or both!) depends on how you stack and pack the short rows into your circular-knit fabric. Shaping portions of an otherwise normally-knit fabric (whether worked back-and-forth or circular) is not the only use knitters have for short rows. It is actually possible to create an entire fabric exclusively of short rows. Here is an example of a seven-sided shape made this way: a baby blanket, perhaps, or a hat. Illustration 1. The first row is teal, the second row, pink. The pink row is shorter than the teal -- it is a short row. Illustration 2. If we continue along making each row shorter than the last, a triangle results. The "bottom" of the triangle is the first row cast on, called the "base." The remaining sides are made of the edges of the short rows: we'll call one the "inside edge" and the other the "outside edge." 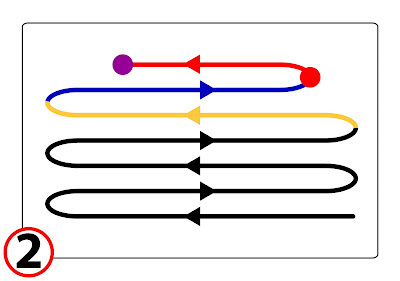 Illustration 3: The outside edge, represented by the gray line, will become one of the seven outside edges of the final item. On the inside edge, represented by the brown line, we'll pick up a row of stitches. This new line of picked up stitches will be the baseline for a new triangle. Keeping to this pattern yields an interconnected series of triangles. In this case, 7 total wedges have been worked, with the last sewn inside edge to the base of the original cast on (the original teal row cast on back in illustration 1). A wedge-knit short row flat shape like a baby blanket, for example, might require quite a few short rows to make each wedge, and each row might be only slightly shorter than the one before. To get a 3-d wedge-knit short row item like a hat would requite fewer total rows, with each short row possibly considerably shorter than the one before. Also, the short rows might not be symmetrical: a hat made of short-row wedges typically has only a very few rows which go all the way through to the center, while the edge of the hat has a great many rows. In other words, just like in shaping using short rows in the middle of a fabric, so here too: how you stack and pack the short rows will determine whether a short-row knit fabric lays flat (baby blanket) or bulges (hat). If you're ready for the how-to, click here to be taken to the follow-up post. You've been reading TECHknitting on: "Short rows: the theory"